Sometimes the best meal -- the one that hits the spot -- is the simplest. Whenever I make breaded chicken, I think about home. I remember my parents making it and serving it with some gravy made from one of those 85-cent powder packets for a quick meal (my siblings consider that "real" gravy -- just like they think Aunt Jemima is "real" syrup). And now, when I want something quick, it's what I tend to make and is one of the few things I can make and improvise upon without a recipe. Sometimes I'll bread chicken and turn it into chicken parmesan; other times I'll have it plain; other times with gravy. On this particular night we had it with a few squeezes of fresh lemon, salad, and some lemon-rosemary potato wedges. I had just received a new John Boos cutting board from KaTom Restaurant Supply and decided with all the chopping I needed to do to make the salad and potatoes that this would be a good night to break it out (and I suppose break it in). At first glance, I thought the cutting board would be too small for my chopping needs, but that little board proved me wrong. It was just the right size for a pepper, or a head of lettuce, and even the pile of potatoes that needed to be made into wedges. And the board is so cute that I will definitely use it as a serving piece at my next party. It would be perfect for crackers and a selection of cheeses. I made the potatoes first since they would take some time in the oven, and I figured I could make the salad and the chicken while they roasted and have everything ready at the same time. I used a recipe for Crispy Roasted Potato Wedges with Parsley, Lemon, and Rosemary (minus the parsley) from Knives Cooks Love: Selection. Care. Techniques. Recipes. First, I mixed chopped rosemary, minced garlic, and oil together in a medium bowl. Then I washed some red potatoes and chopped them into wedges. I had never made wedge potatoes before because I don't like how I've had them in restaurants -- insides not fully cooked and the outsides not always crisp. It was my mission to cook these all the way through and maintain a crispy outside. Once I had the potatoes all cut, I dumped them into the bowl and coated them with the olive oil mixture. Then I poured them onto a sheet pan lined with foil. You have to make sure to lay them with a flat side down -- more surface area to crisp up. After roasting them for 25 minutes in a 450 degree oven, I flipped them all onto the other side and roasted them for an additional 15 minutes, following the recipe. ...and breaded the chicken. This simply takes setting out a plate of flour; a bowl with two eggs, beaten; and a plate of breadcrumbs. My boyfriend pounded two chicken breasts while I set the breading station up. Pounding the chicken ensures that it will be about the same thickeness everywhere and thus cook more evenly. I dredged the pieces in the flour and then coated them with egg and breadcrumb. Sometimes I bake these, but this time I cooked them on the stovetop since the potatoes were taking up the oven and chicken cooked in a pan comes out crispier than baked chicken anyways. I poured olive in a pan, heated it, and added a chicken breast, turning halfway through. Then I removed that one and cooked the next one. The pieces were a little too big to fit both in the pan at once, otherwise I would have cooked them simultaneously. The potatoes and chicken were done at just about the same time. I removed the potatoes from the oven -- they were piping hot and very crisp -- and sprinkled lemon zest over them. We had a delicious crunchy and citrusy dinner. It made me think of the better-for-you, much tastier homemade version of a horrible fast food meal -- like chicken nuggets and french fries. It was crunchy without oozing oils or having that deep-fried taste, and the lemon and herbs were refreshing. As promised, here's the scoop on dining in Aruba. As it turns out, Aruba is not much of a foodie destination. I had heard that this or that restaurant was good when I mentioned to people I was going to Aruba, but what I found was not up to my standards. I researched a ton of restaurants ahead of time, memorized the ones I wanted to go to, made reservations at a couple, and just hoped I'd happen upon some other good ones while there -- maybe diamonds in the rough, which, by the way, Aruba seems to have plenty of diamonds, but not many "food gems." All in all, we (my boyfriend and I) decided the food experience was very lacking and very overpriced. It's good to have his opinion as well, to balance mine, because I can be a bit of a snob when it comes to restaurant food, but we were in agreement on every bite. The first place we tried was L.G. Smith's Steak & Chop House. It was close to our hotel, which made it a perfect choice for our first night on the island. We left unimpressed. This may have been our own faults. Wanting to be like Julia Child, I ordered the sole meuniere. Julia and I did not have similar experiences. My boyfriend got the night's special: mahi mahi. Maybe we should have ordered steaks or chops. The fish was just okay -- I actually enoyed the mixed vegetables that came with my sole much better than the main element of the dish, perhaps because they were well salted. The worst part of the meal was dessert. We ordered chocolate cake, which can only be described as a Sara Lee chocolate layer cake, removed from its box and set on a countertop a week before serving. It was so dry. The best place I ate at all week was El Gaucho, also near our hotel in Oranjestad. A friend from college recommended I check it out if I liked steak, and all it took was the word steak to prompt me to make a reservation. And I'm so glad I did. And dessert was just as good as the meal! My boyfriend had the Dutch apple pie. And I ordered fried cheesecake. What better way to top off the 13 ounces of steak I polished off (had to leave a little to gnaw on the next day). The outside was warm and crunchy, and the inside was a fairly light cheesecake. It wasn't soaked in oil or overly heavy like you'd expect something "fried" to be. We had to have dinner at La Trattoria - el Faro Blanco at the California Lighthouse. We had heard that the food wasn't so great but the atmosphere was worth experiencing. And it was a very pretty restaurant with a beautiful view. We could have (and should have) just gone for drinks and watched the sunset, but we decided to give the food a shot. Bad decision. We shared an appetizer of beef carpaccio, which should have been called deli-sliced roast beef salad. I couldn't believe the meat when I saw it. And the experience grew worse with dinner and dessert. I tried to order something simple, something difficult to screw up, and went with pasta with prosciutto, onions, and tomato sauce. Unimpressive. My boyfriend ordered veal parmesan, which was ok, but not too flavorful. I could have made those dishes much better in my own kitchen. I started thinking that I could be a restaurant consultant. This place obviously draws a crowd, as it's pretty much the best spot to see the sunset, so it's not lacking money. Why not cut down the menu, focus on making a few really great dishes, and put a little more money into the ingredients? "Why not?" my boyfriend said, "Because they don't have to." In my opinion, that's a crappy attitude. But I am an overacheiver, and I do like to be the best at everything. It's sad that such a beautiful restaurant wouldn't feel the same way. Is it really just about the profit? Shouldn't it be about leaving people stunned and happily satisfied with their meals? On our last night, we had a reservation at Madame Janette's. We drove around for an hour and a half trying to find the restaurant, asked a handful of people for help finding it (no one knew where it was), and tried calling for directions (no one picked up the phone). Sadly, we missed our reservation. I had it in my head that Madame Janette's would be our best meal, which is why I wanted to dine there on our last night. We had a gorgeous table. The inside atmosphere had kind of an old world feel. Everything was lacy and antique-looking. We shared French onion soup topped with Gouda to start. The broth was well-seasoned and heartier than any other onion soups I've had, and the Gouda gave it the Dutch touch you'd expect in Aruba. For dinner, my boyfriend ordered the T-bone with grilled peppers. It came served on a hot stone. It's a very nice idea, but as the steak sits on the hot stone, it keeps cooking. A rare-steak lover, I would have had to gobble it down quickly. I ordered chicken in garlic cream sauce. I'm still not sure why I ordered chicken; I'm usually more adventurous. I thought the dish was just okay, until I grabbed the bunch of basil garnishing the dish (maybe I should have used that rosemary too), ripped it up, and tossed it on the chicken. Then I cut a piece of chicken and scooped up some rice and sauce with it and had a delicious mouthful. I proceeded to eat the whole dish like this, stopping to taste the melon served with capers and the unidentifiable (but very good) mashed vegetable on the side. And since we don't give up easily, we once again ordered chocolate cake for dessert (a little of this has to do with our difficulty in agreeing on desserts). This time we were happy. The cake was moist and fudgy, as a good chocolate cake should be. We mostly went to Aquarius (the restaurant in the adjacent hotel) for breakfast because you can't really go wrong with a buffet and made-to-order omelettes and waffles. But every so often we would venture to another place, like on our last morning. We decided to try out the nearby Dutch Pancake House. The service was lousy, but the food, when we finally got it, wasn't too bad. My boyfriend ordered a crepe with bacon, eggs, and cheese. I was expecting a crepe filled with bacon, eggs, and cheese. But they actually incorporated the filling into the crepe. It was very interesting, a little salty (the bacon was more like ham), but tasty overall. I ordered the strawberry fields -- a crepe with fresh strawberries and ice cream. I kept my fingers crossed that the strawberries really were fresh (we didn't have much luck with fruit platters on this trip), and they were! And we split a plate of adorable profiterjes. They were like little pancakes coated in cinnamon and topped with some butter and powdered sugar. The coffee served at the restaurants was decent, but several restaurants served a yellowish liquid, which when we asked, they said was cream. Not buying it. I miss the sunshine, but I'm so happy to be back home with my Breville and my Starbucks... and all the Boston-area restaurants and my own kitchen! You may remember that I wrote about Alone in the Kitchen with an Eggplant: Confessions of Cooking for One and Dining Alone a while ago. In it, Jenni-Ferrari Adler collects essays from writers including M.F.K. Fisher and Laurie Colwin about eating alone or cooking meals for one. I have actually only gotten halfway through it because I just pick it up now and then to read an essay. I like that you get different perspectives, different settings, and different writing styles about the same subject matter, sometimes with different interpretations. Eating is usually something shared, but sometimes it's not, and that's what this book focuses on -- or at least the essays I've read so far! It's all about what people do when they eat alone as opposed to when they share meals with others. Do they still cook extravagant things? Does dinner become a bowl of cereal? And this book also offers up some recipes! Always a plus. Remember, I'm away until March 20, so you won't get responses from me until then. Reading about Judith Jones' life in The Tenth Muse: My Life in Food is just fascinating. If you're someone who loves food and editing, like I do, you'll probably grow quite envious while reading this. I wonder why I couldn't have her life. You'll learn about how Jones became an editor at Knopf and find out interesting things about the authors she worked with. Here's a woman who interacted with Julia Child and Marcella Hazan and Jim Beard. She has had a wonderful life filled with all the things I wish I could do in my life. And there are recipes at the back of the book. I haven't made any yet, but I have "A Cornish Hen with Herbal Stuffing Under the Skin, Broiled" bookmarked. There were a few parts I skimmed more than read, but for the most part, I really enjoyed Jones' writing and life story, and I think you will too. Barbara Kingsolver's Animal, Vegetable, Miracle: A Year of Food Life is one of those books that really gets you thinking. Could I spend a year eating only locally grown food and growing my own food? I doubt it. But Kingsolver's book is inspiring, and I do think I can change some of my food-buying habits based on what she did and her advice. From time to time one of the babies would be overtaken by the urge for a power nap. Staggering like a drunk under the warm glow of a brooder lamp, it would shut its eyes and keel over, feet and tiny winglets sprawled out flat. More siblings keeled onto the pile, while others climbed over the fuzzy tumble in a frantic race to nowhere. Descriptive passages like this run throughout the book and enable you to picture exactly what Kingsolver is doing and seeing. And among Kingsolver's story is practical and useful advice from husband Steven, another point of view from daughter Camille, and recipes -- wonderful recipes using fresh ingredients! Chapter 9 - Six Impossible Things Before Breakfast is my favorite part of the book. Kingsolver brings up the effects women's rights had on the kitchen. This is really when prepackaged, prefab foods came into play. As I've said before, I obviously think women should have rights, but we did not compensate for this. We didn't put someone else in the kitchen to replace the wife or mother who had always been there. Who's cooking now? (Obviously, I'm really generalizing here... because plenty of people do still spend time in the kitchen, myself included.) You have to read the passage to really understand the issues here. I don't want to give too much away. She also talks about lactose intolerance in this same chapter. Many people don't know that we really shouldn't be drinking milk as adults. Our digestive systems were never designed for that. Calves drink milk from their mothers. We should not. And I like that she points out that many people don't realize their lactose intolerance: "Physicians will tell you, the great majority of lactose-intolerant Americans don't even know it. They just keep drinking milk, and having stomachaches." This book is filled with information about what we eat, where we get our food, and what we can do differently. The writing is informative but also descriptive, narrative, and fun. I call this a must-read for anyone interested in food. Ruth Reichl's Garlic and Sapphires: The Secret Life of a Critic in Disguise is an incredibly funny and interesting read. I originally picked it up because two of my favorite things are in the title: garlic (who doesn't love it?) and sapphires (my birthstone), but beyond that and the knowledge that the book was written by Reichl, I didn't quite know what I was getting into. Even though Reichl has written other books before Garlic and Sapphires, it was the first of her books I came across. I enjoyed it so much that I've since read a couple others. Not only does this book share with you some of Reichl's great disguises she used when she was a restaurant critic, but it gives you a lot of insight into her life, and you can see why she's now at the top of Gourmet's masthead. The book contains the restaurant reviews she wrote, which I find incredibly interesting, as well as recipes, and of course her story. It's interesting to see how differently she was treated at restaurants depending on how she was dressed. It's a reminder to all of us that one visit to a restaurant does not constitute a comprehensive review. The service can change, the food can change, the amount of food can change. I can say I definitely would have loved to have been dining with her on the days the restaurants saw through her disguises! This is a timely recommendation with the movie version coming out soon. I have to say I was definitely excited when I heard this book was being made into a movie, and even more excited when I saw what an amazing Julia Child Meryl Streep portrays. I would call Julie Powell's Julie and Julia: 365 Days, 524 Recipes, 1 Tiny Apartment Kitchen a blogger's fairy tale. Powell is at that sort of mid-life crisis (before mid-life) and just decides to cook every one of Julia Child's recipes in Mastering the Art of French Cooking, and then she blogs about it. This book is her personal journey (yes, another one -- you can see what kind of books I'm into). It's funny and fun to read and also inspiring. I wish I had the time (and money) to make all of those recipes too! To get things started, I thought I would write about a book that encompasses food, travel, and relationships. It seemed fitting considering I am traveling to Aruba with my boyfriend and planning to have lots of delicious meals! I was swept away by Elizabeth Gilbert's Eat, Pray, Love: One Woman's Search for Everything Across Italy, India and Indonesia, as I have heard many were. Just look at the cover design: Eat is written in pasta, pray in prayer beads, and love in flowers. It's simple, yet it ties in so well with the themes in the book. It's been a while since I've read it (and actually I may take it on the plane with me to reread it), but I remember being drawn in and affected by so many parts of it. It's always interesting when you read a book and you can really empathize with the author but also feel like she empathizes with you, that she knows you. The book is divided into three parts (called books) because the number three is important, and Gilbert explains why in her introduction. I most enjoyed Italy. How shocking that I would be so fond of the "Eat" part. But it wasn't really the food that sucked me in this time. It was Gilbert's relationships. About her husband, she says, "I equal parts loved him and could not stand him" (12). I think that's something most women who have been in long, and not so wonderful, relationships can attest to. And then there was her relationship with David. I don't want to tell you too much because I want you to read it and find everything out yourself, but I think this is another of those relationships we may have all been in at one time or another, that we cling to, and Gilbert conveys it so well. She moves on to India and then to Indonesia, working out her issues along the way. She sees things about herself that when you read them you can determine whether you see those same things in yourself. There's depression, there's loneliness, there's finding oneself -- through food, prayer, and love -- and there's eventual happiness. This is a travel memoir and a personal journey. I felt a real connection with this book. It made me laugh and cry, as a good book should. A book is different to different people, and because I felt like chunks of my life were in this book, I loved it. I hope, that if you haven't already, you will read this book, and maybe feel empowered by it... or at least really enjoy it. I've had it with this cold, nasty weather! So bon voyage! I'm off to Aruba for the week. I'm looking forward to sharing my warm, sunny adventures with you when I get back. Don't worry: I plan to have plenty of food pictures (I've been researching where to go out to dinner for more than a month now!). But in the meantime, I decided I would let you in on a passion I have that comes second to food: books. I love reading. I definitely used to read a whole lot more before my interest in food developed to this extent, but I still read as often as I can -- even if it's just a page or two before bed. I often write about cookbooks I use and enjoy, but I want to take this opportunity to introduce you to some food fiction and nonfiction books I've enjoyed. These are just basic thoughts and little snippets because I don't have much time to write in the midst of packing and organizing, but you should still be able to glean some insight into each of the books. Be sure to stop back during the next few days to read about some of my favorite food books. You might even find some new favorites to add to your collection. It must be chili season. Everyone's talking about it; everyone's making it (I know because as soon as I decided to make it, chili postings started popping up on blogs everywhere). I got an email from Cookstr the other day with the top 10 chili recipes, and the more I looked through those recipes, the more I started craving chili. And in spite of living right down the street from one of Bon Appetit's top chili spots (No. 7), I decided to make my own. I remembered a recipe from Art of the Slow Cooker that I had been wanting to try for a while because it's a no-bean chili. Everyone has his own opinion of what makes chili chili. I've heard that the original Texas chili recipes were devoid of beans, and I'm a big fan of that. I like beans sometimes, but I prefer a hearty, meaty chili poured over some wide egg noodles or white rice; topped with cheese; and flanked by warm, buttered corn bread (it's perfectly acceptable to use a box of Jiffy cornbread mix, in my opinion). So it was with this in mind that I set out to make Andrew Schloss' Sirloin Chili (No Beans). Following the recipe, first I seasoned the meat (sirloin cubes rather than ground beef are used) with some salt and pepper and then browned it in oil and moved it to the slow cooker. 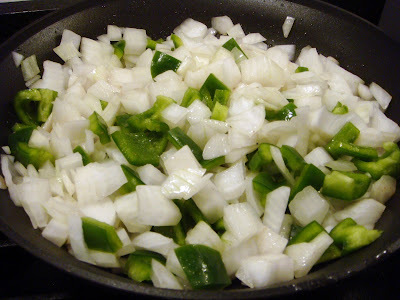 Then I took my diced onion (I used a very large onion) and green pepper and sauteed those in the same oil. Now, here's the part where we can debate whether I actually made chili. I was supposed to add chiles and garlic to the pan at this point, and I left the chiles out. Here's my reasoning: I'm a wimp when it comes to spicy hot foods! I was making the chili on Tuesday night, but we weren't going to eat it until Wednesday night -- and you know what would happen to those chiles overnight. So because I knew the heat would only intensify, I played it safe and didn't add any chiles (later ground chile is used). Then I added some flour seasoned with cumin and oregano. Next in: some beef broth and crushed tomatoes. The recipe calls for 1 1/2 cups of crushed tomatoes, but I just threw in the whole 28-ounce can. I figured since the chili would have until the next night to thicken and I'd have to reheat it, during which time it would likely thicken more, this would probably be okay (it was). Once it finished heating, I poured this whole mixture over the meat and left the slow cooker to do its thing. I put it on high since I wanted to go to bed at some point that night, and high would only take 4 to 5 hours. After the 5 hours, I moved the chili to some Tupperware to cool and put it in the fridge. The next night, I poured the chili into a pot, set it on the stove, added the ground chile to it, and let it heat until it was thick and piping hot. As the chili was heating, I baked cornbread, made rice in the rice cooker, and boiled up some egg noodles. My boyfriend ate his chili over rice, which is more traditional. I had mine over egg noodles, which I prefer. It wasn't spicy hot, but it did have a little kick and all the essential chili flavors. It definitely was comforting and warming on a chilly night. Note: I took the leftover chili for lunch that week, and the flavor intensified each day but never got too overpowering. It microwaved well too; the meat stayed tender. How do you like your chili? Are beans essential or a no-go? Do you like it super hot or mild? Do you make it in the slow cooker? Do you use ground beef, sirloin, a mixture of meats? Some people add squash or potatoes, do you? And what do you serve it with? Can't wait to hear your chili ideas!